Thousands of fans have attended a memorial service at Imola as part of a four-day tribute to mark the 20th anniversary of Ayrton Senna's death. The three-time world champion died aged 34 when his Williams crashed during the 1994 San Marino Grand Prix. "There is a bigger turnout at Imola than I expected. Twenty years on, Senna is clearly not forgotten. "It's a Bank Holiday here in Italy and that has brought out a large and enthusiastic crowd. This is a typically Italian event, but there are plenty of Brazilians and people from all over Europe. "Ratzenberger is not forgotten either. There was a mass for both drivers on Wednesday and Ratzenberger's parents took part in it." Family members, plus past and current drivers, also gathered as a silence was held at exactly 14:17 CET (13:17 BST). Double world champion Fernando Alonso, among those at Imola, said of Senna: "For a lot of us, he was our idol." Gerhard Berger, Senna's team-mate at McLaren, added: "He was the best driver of all time." Thursday's commemorations began with a parade to remember both Senna and Austrian driver Roland Ratzenberger, who died in qualifying on the same track a day earlier. Fans from across the world were at the Italian circuit, many laying flowers at the feet of the bronze statue of Senna, which stands on the inside of the track near the corner where he crashed. Alonso and Ferrari team-mate Kimi Raikkonen, plus members of Senna's family, including his niece Paula, also attended. "It's so emotional for us because it's a long time and still the love from the people is very alive," she said. "This is very special for me because we are the family, but it seems like Ayrton is living inside people's hearts, so it's beautiful." Alonso added: "For a lot of us, he was our idol. I used to watch his races on the news and when you saw that yellow helmet and the No. 1 on his car, that really hit you as a kid." The parents of Ratzenberger have also visited Imola, attending a memorial mass at the track on Wednesday. Ratzenberger's father, Rudolf, said he and his wife, Margit, were "very touched to see that there is so much interest" in their son. 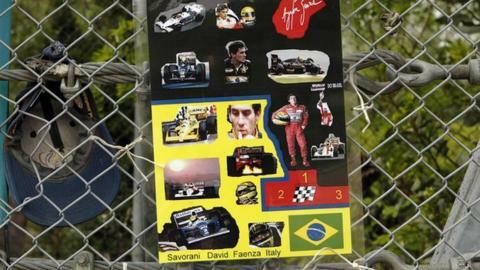 He added: "Senna is also in our hearts." Former world champion Nigel Mansell was among drivers past and present to pay tribute to his "toughest" rival. "He would leave no stone unturned to get the utmost out of his car and his team," said the Englishman, who won the world title in 1992. In an interview broadcast on Radio 5 live, Mansell added: "In the 1980s, I was blessed to drive against so many great drivers but Ayrton certainly stood out most among them." Lewis Hamilton, a world champion in 2008, said: "Ayrton Senna was an incredible legend, who will be remembered and admired forever. Senna is also being remembered back in his homeland, with fans visiting his tomb in Sao Paulo. Corinthians players wore replicas of the helmet worn by the driver, a big fan of the football club, before the start of their recent Copa do Brasil match against rival club Nacional. A Brazilian airline has also honoured Senna by painting the colour of his helmet on a plane's nose. The 1994 San Marino Grand Prix was a dark moment for F1. On the Saturday, Ratzenberger, 33, was killed when he crashed his Simtek in qualifying. The four-day commemoration at Imola will include exhibitions, films and talks about the racer. There is also a conference to discuss the evolution of safety in F1. The circuit is open to the public, who will be able to participate in a variety of races, including a Senna memorial kart race on Friday, while children will be able to race electric karts and pedal cars in the paddock. There will also be a memorial football match in Imola, a charity dinner, and parades of F1 and GT sport cars.